In which our heroine rock climbs without quitting. Sort of. At the bouldering gym my instructor was wearing a shell-and-nut necklace. A choker, really. He was ripped and humble like most climbers, with the defined veiny forearms of a heroin addict, but the good nature and good looks of someone who gets high the natural way: from climbing rocks and walls. I hadn’t been at all sure about even moving from my futon to the floor in the morning. But when I feel that way, sometimes I make myself leave my bed, get out of my house, and pursue some activity anyway, just to make things better. 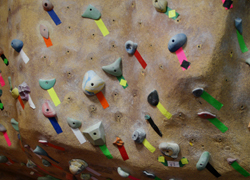 I left, the morning faded, and by late afternoon I was at the bouldering gym deciding that a sport like this, something done by healthy, hip people who probably love to get out of bed in the morning, sounded promising, so I decided to take a beginner’s lesson.